Neilie was still resting on the rooftop when he heard the pop of a can, a very particular can. He stayed out a little longer, before stretching and jumping back onto the ledge of the window. He licked his paw, then rubbed it on his face to clean himself off before making a cute meow. "Yay! The kitty's back!" Maria cried, running over and giving him a hug. She was afraid he'd left. "Are you hungry kitty?" she asked. "Big Brother opened a can of tuna just for you!" She set him down by the food. Howard Link sighed as he stepped out of his superior's office. They had told him, in no uncertain terms, that while his solution of outpatient procedures was ingenius and necessary in this situation, they would never completely release the cat experiment. Even with his reports of how he was treated. This will take a lot of work, he thought, rubbing his temples. He could feel a headache coming on. Neilie eat the food out of the can, then climbed out the window again, sitting on the roof, licking his paws. He wanted to let the sun warm him before it completely went down. He sighed, deciding he was worrying the other two, so he instead jumped down and laid out in the front yard in the grass. It wasn't as warm, but it would do for now. Byakuya laughed, "I can see he's feeling better. Tuna and sunbathing do wonders apparently." "Kitties like the sun. Didn't you know?" Maria said, moving Sakutaro so it looked like he was talking instead of her. "We cats like where it's warm. That's why Maria's room is the best!" Byakuya chuckled and patted the stuffed animal's head, "Oh? I didn't know that applied to lions as well." "Lions are kitties too," Maria made Sakutaro say. "I hope me and the kitty can be friends." Then Maria began to speak for herself instead of the stuffed lion. "Of course you can, Sakutaro!" She laughed and went outside to sit with the kitty. Byakuya watched her with a smile on his face and went into the kitchen to chop up some vegetables for dinner. "Kitty! I made a headband for you!" Maria said excitedly. She showed the headband in question, hoping he'd like it. "That way, if you wanna go around as a person you can wear this and people will think your ears are on the headband." Neilie looked over to the girl who had called him by that name. He tilted his head in question, then she began to talk about a headband. Of course, Neilie wasn't going to stay in school, but he figured that he would at least be able to walk around town with it, so he meowed in response. "Oh, but we need a name for you, Kitty," Maria said with a frown. "We can't just keep calling you kitty. I know! How about we call you... Beato!" She laughed, thinking the name cute. Byakuya cleared his throat from the other room, "Beato is a female name, the cat is male." "Beato can be male too!" Maria replied curtly, but her brother did have a point. She gave in after a few seconds and asked, "What should we call him, then? I don't wanna keep calling him kitty." 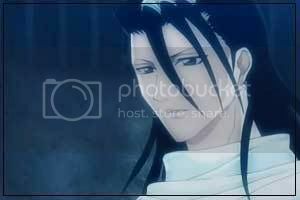 Byakuya sighed, "Perhaps he already has a name, he just needs some time to tell us and settle in." "I'm a boy! Don't make me prove it," He said, "and of course I have a name! Why wouldn't all? Everyone has a name right? Jeez, what makes you think I don't have one." He said playfully pouting and crossing his arms. Maria shuffled her feet a little guiltily. "Well, you didn't tell us your name when you came, so I didn't know you had one..." The truth was that she kept forgetting he was also part human because he was so cute as a cat. 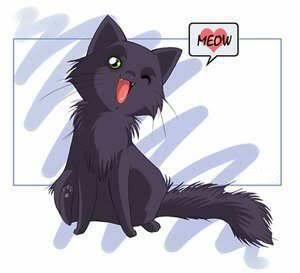 Byakuya smiled, "That is true and you are much more talkative as a cat." "My name is Neilie," He said, "I don't talk much usually because I wasn't allowed to before." "Neillie's such a cute name!" Maria squeeled, glomping the cat boy. "It's the cutest name ever! Even cuter than Sakutaro!" She then picked up her stuffed lion. "No offense," she added to it, then made it reply, "None taken." Byakuya nodded, "It suits you." "It's going to be nighttime soon. We should probably go inside or we'll get a cold." Maria looked up at the sky as well. She nodded. "It's dinner time, too!" she said with a big bright smile. She was hungry, too. 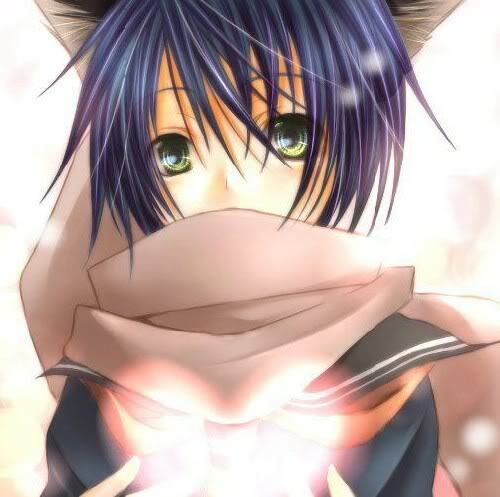 Byakuya had went back into the house and called them in after him, "I made tuna sandwiches and soup!! Hurry up before it gets cold." "Yay!" Maria cheered, scooping up Sakutaro and running in. She sat at the table and began munching on her sandwhich and eating her soup. "It's really good, Onii-chan!"